If we are to realistically address the increasing demand for quality education in a debt-strapped developing country such as ours, it is essential to allow a parallel system of private education opportunities within a policy environment that makes entry affordable and accurate information better available. In its Budget for 2019 the Government has reiterated its commitment to provide no-interest loans to students pursuing higher education in non-State universities. This is a long overdue recognition of the role played by the private sector in expanding opportunities in higher education. Recognition for private contributions should be extended to school education too but with some modifications. For example, loans for students pursuing higher education should be translated to grants for parents of school children. These grants should materialise from savings made by the Ministry of Education through the streamlining of national and provincial bureaucracies, not by dipping into the Treasury debt pool. In designing policies for higher education or school education it is important to understand what is signified by a cut-off mark for admission to State universities or to ‘popular’ secondary schools. The cut-off mark is an arbitrary number determined according to the number of slots available in public universities or popular secondary schools. If the cut-off Z-score for 2.1808 for the Faculty of Medicine for a student applying from the District of Colombo, it means that those getting 2.1808 or above get a 100% free of charge of education while somebody getting 2.1800 does not get any State support. Thankfully, these inequities are being addressed, slowly but surely. For decades a vociferous minority who gained access to free higher education and university teachers who benefited from a State monopoly situation determined that private education is evil, and the solution was to keep increasing free public opportunities. Succeeding governments have indeed increased opportunities and today the percentage of youth receiving free education at public universities is 7% of the 18-24 youth cohort. What about the freedom of other 93% to pursue their aspirations with or without State assistance? Individual freedom is enshrined in our Constitution. To be free is to be not subjected to the arbitrary will of another. Governments past have hidden behind the pipedream of free public higher education for all and allowed a silent majority to be subjected to the will of a minority opposing private education. There is no plaque to mark the first degree awarded by a private institution in this country, but the ideological opposition has been overcome, and now our youth have many private alternatives for pursuing higher education. Freedom of choice is not just about having alternatives. The alternatives have to be affordable and the information available. The loan scheme of the present Government goes a long way in making private education more affordable. However, we need to be cognisant of the student debt trap phenomenon experienced by youth in developed countries. Addressing such concerns require more thought but the loan scheme is a necessary first step. Missing also is an effort to make comparative information available. A simple online registration system, the data on which is accessible to the general public, is the next step. At LIRNEasia we developed such a tool where anybody can search for private higher education opportunities by entering the desired field of study (See http://www.educationforum.lk/higher-education). The purpose of the tool was to demonstrate the concept. It is up to the Government to continue such a dash board. Cost of education and other details can be compared by prospective students, if the educational institutions are mandated by Government to make those available. Meeting the demand for a quality school education is another burning issue. For example, there are close to 200 international schools in the country serving the needs of parents who have not been served by public sector. Yet, these private providers are met with hostility. 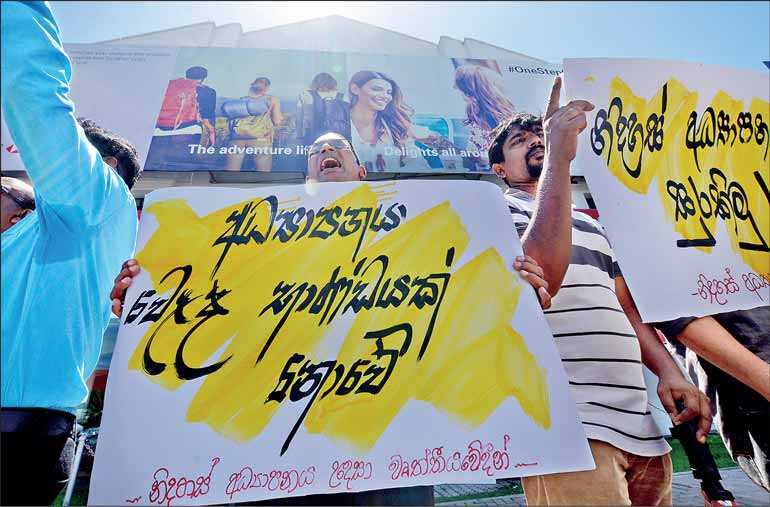 If the Ceylon Teachers’ Union (CTU) has its way, private schools will have no place in school education and they should be taken over by a Government which cannot manage its own. CTU is against regulating private schools citing that would give undue recognition to these schools. On the other hand, the Child Protection Authority says they receive complains about mistreatment of children in private schools and they insist on regulation. The tone of the Authority is hostile. The CTU is repeating self-serving slogans and the Authority is singling out private institutions. The attitude to private education is similar across the spectrum from school education to higher education. Either private education is seen as inherently evil or inherently of low quality. There are good reasons for regulating private education but not based on false assumptions such as these. Not all 355,000 or so students sitting for the Grade V Scholarship exam possess superior cognitive abilities, but to parents, their child is special and they aspire for the best for them. The present Government and governments past have made efforts to make the neighbourhood schools attractive, but there will always be some schools that are more popular than others. To the Government’s credit the number of these sought-after schools have increased from 107 in 2007 to 186 in 2018, but there are serious inequities in awarding spots in a popular school. For example, a majority of the places in these ‘popular’ schools are already filled by students admitted to Grade 1 using miscellaneous criteria including past pupil status of parents and proximity evidence which may or may not be true. It is not the intention of this article to critique these admission practices because these schools are probably popular because of the presence of more privileged persons of society who have used their privilege to secure places beginning in Grade One. The purpose here is to note that quality public options for parents are severely limited. The 186 or so ‘popular schools’ create one to three new classes worth of new slots in the Sixth Grades every year to make room for admissions based on Grade Five scholarship results. For example, Royal College of Colombo may have 10 or more parallel classes in Grade 6, but according to Ministry of Education sources, only three class equivalents are open to scholarship students; Maliyadeva College in Kurunegala, for example, offers two classes and Dharmaraja College in Kandy offers only one new class for scholarship students. In 2019, 86 schools made available three new classes, 69 schools availed two new classes and 36 schools availed only one new class, in the Sinhala medium. If we assume that a class in a popular school is typically packed with about 50 students, the maximum number of slots available for Sinhala medium scholarship recipients is about 16,000. Similar to the case of higher education, the cut-off mark for admission to these schools is determined by the number of slots available. In 2019, a student needed to score 93.5% or more to secure a place in Royal College and 94.5% for Visakha Vidyalaya. Other schools require lesser scores. If you lived in a Hatton, for example, you needed 81% or more to secure a place in Handunuwewa Central College, a Sinhala medium school. What if your child received 80% and you believe that other schools in Hatton do not provide the education you wish for your child? If the Ceylon Teachers Union or anti-private education activists have their way, the parents of the rest of the children should just make do. Mercifully, parents have private options. There are 34 historical private schools, including Musaeus College, S. Thomas’ College and Trinity College, which were allowed to remain independent and unaffected by the takeover of schools in 1961. There is a further set of 46 assisted private schools including St. Joseph’s College, Wesley College and Carey College, which continue to receive State assistance but are managed by independent boards. Additionally, there are now 200 or more international school s that have emerged, having bypassed the archaic law of 1961 that prohibits setting up private schools. The total of private options now exceeds 280. Parents have voted with their feet to validate these institutions and the clock cannot be turned back. Twenty-five of the international schools have organised themselves as The International Schools of Sri Lanka (TISSL) and they claim to enrol 40,000 or more students or roughly 3,100 entrants per year to those schools. If we make the modest estimate that each of the other ~175 international schools enrol 50 students per year on average, international schools together provide an additional 12,000 slots for new entrants per year. (We did not count historical private schools because admissions to those may not be as open as admissions to international schools). Parents need some guidance in selecting from among these private options, but command and control regulation can do more harm than good. Unfortunately, our politicians and bureaucrats only know how to issue circulars. There is no follow-up and they don’t care about cost of compliance and adverse impacts. Open data is the modern approach to regulation. As in the case of higher education, the Government should require all private institutions to upload comparable data on facilities, qualifications of teachers and past success of students at examinations on to a public website which contains tools for anybody to compare and contrast available opportunities in terms the attributes they value. The Ministry of Education does not need an army of inspectors to monitor. Thousands of eyeballs can impose self-regulation on contributing institutions. Self-regulation through open data is better than the discretionary judgment of inspectors who may or may not be swayed by graft. In cases where the international schools fill gaps in public education opportunities, scholarships should be provided to students to attend these institutions. Students who do well at the scholarship exam but fail to secure a public school of their choice should be the first to benefit. In some public schools, no matter how much money the Government pours into the system, structural and cultural barriers prevent them from performing. In such a scenario, if there is a higher performing private school in the vicinity, it would serve the public interest better if the students are awarded scholarships to attend the private alternative. Plush facilities or qualified teachers do not necessarily provide a good education environment. I have seen private institutions operating with shoe-string budgets providing a student-centred education which none of our popular schools can say they provide. Do not be misled by appearances. Some of our best schools started as mud-huts.